We've been having lots of fun with spaghetti squash lately in our house and this is one of my favorite recipes! We just used everything we normally would for a Southwest turkey burrito or taco and mixed it in with some baked spaghetti squash. It's super easy and super healthy. 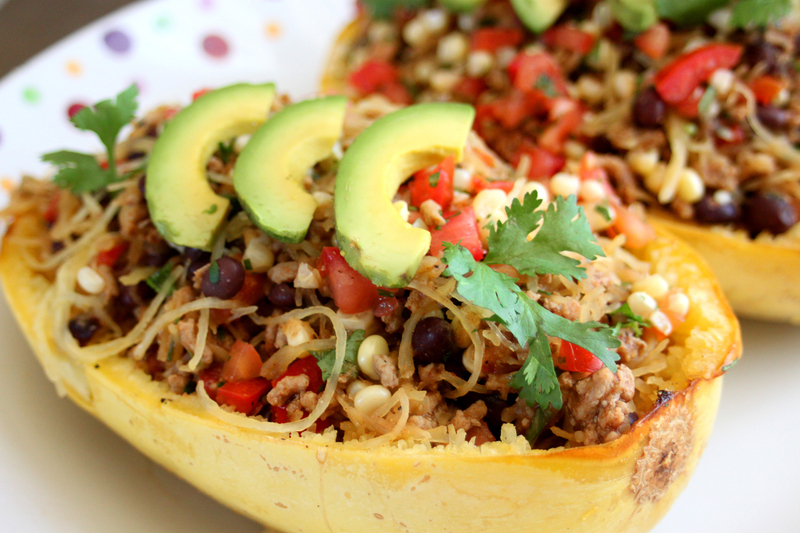 Enjoy this dish with friends, as a large spaghetti squash will feed up to 6 people with this recipe! This dish can be served hot or cold, so it works for lunch or dinner any day of the week. The leftovers are just as delicious, and if you add a few scrambled eggs the next morning, this is a fantastic leftover breakfast! Using a large knife or a cleaver, slice the spaghetti squash in half lengthwise down the middle. Use a spoon to remove the seeds and center strings. Drizzle the two halves with 2 tbsp. of olive oil and then sprinkle with salt, pepper and 1 tsp. garlic powder. Place the squash, open side down on a cookie sheet and bake for 30 minutes. Remove from the oven, check to see if the squash is soft and easily comes up with a fork into a spaghetti like texture. If it's too hard to remove, cook for another 10 minutes. Remove from the oven, scrape and fluff the stringy squash with a fork. Transfer the spaghetti squash to a large mixing bowl, but reserve the shells. Heat a large skillet with 1 tbsp. olive oil on medium heat. Add the ground turkey, scallions and red bell pepper. Season with salt and pepper, 1 tsp. garlic powder, cumin, chili powder, paprika and cayenne powder. Stir to combine and continue to cook on medium heat until the veggies are soft and the turkey is browned and cooked through, about 7-10 minutes. Remove from the heat and set aside. In the large mixing bowl with the spaghetti squash, add the turkey mixture, tomatoes, corn, black beans, cilantro and lime juice. Stir with a fork to mix until all ingredients are combined. Adjust seasoning if necessary. 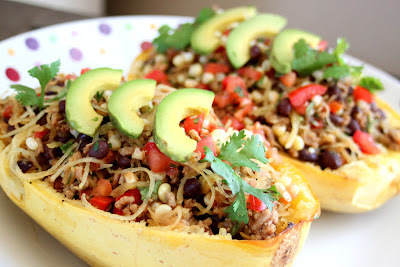 Fill the two squash shells evenly with the mixture, garnish with the avocado slices and a few more sprigs of cilantro.